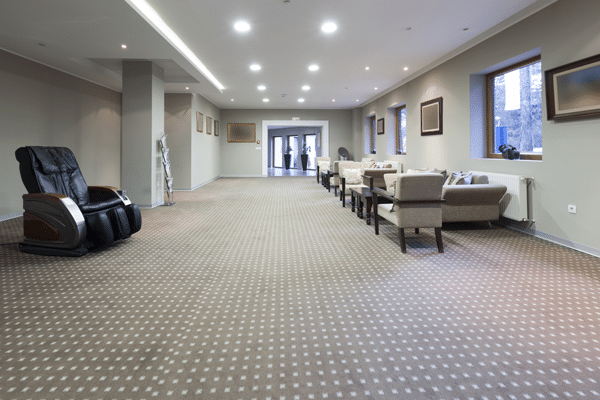 One of the best ways to improve your company’s appearance to visitors is to arrange for commercial carpet cleaning services at least once every year and more frequently if your business involves regular foot traffic. What Is Involved with Commercial Carpet Cleaning Services? The process needed to properly clean commercial carpets is similar to that involved when washing residential rugs. The goal is to remove loose dirt first before attacking harder-to-handle ground-in dirt and stains. Here is a look at the steps our trained and experienced professionals rely on to clean carpets in commercial buildings. Initial vacuuming – The first step we take is to eliminate loose dirt from the surface of your carpeting. Pre-treatment of stains – Stains on the carpeting are pre-treated with an emulsifying solution in order to prepare for a thorough cleaning of the area. High traffic areas of the rug also undergo pre-treatment to help loosen staining and embedded dirt. The treatment solution is allowed to sit for several minutes to ensure that it has time to work. Cleaning of the carpet – Special, high-powered equipment is used to extract the soil from the rugs. Our carpet cleaning equipment heats the water to a full 200 degrees, enabling easier and faster cleaning. All areas of the carpet are cleaned, including hard-to-reach places. Inspection – Once the cleaning process has occurred, our technicians inspect the entire carpet for trouble spots that did not become clean properly. Post-treatment – If necessary, our service tech will conduct spot treatments in order to take care of any residual stains that exist. Conditioning and grooming – We use air movers to help speed up the drying process, allowing us to groom the pile of your commercial carpet for the best appearance. It is important to schedule commercial carpet cleaning services through a professional company at least once a year. If your business undergoes heavy foot traffic, you might want to consider getting this done more frequently.